A team of graduate students from Colorado School of Mines took first place in an international case competition focused on mining and sustainability. 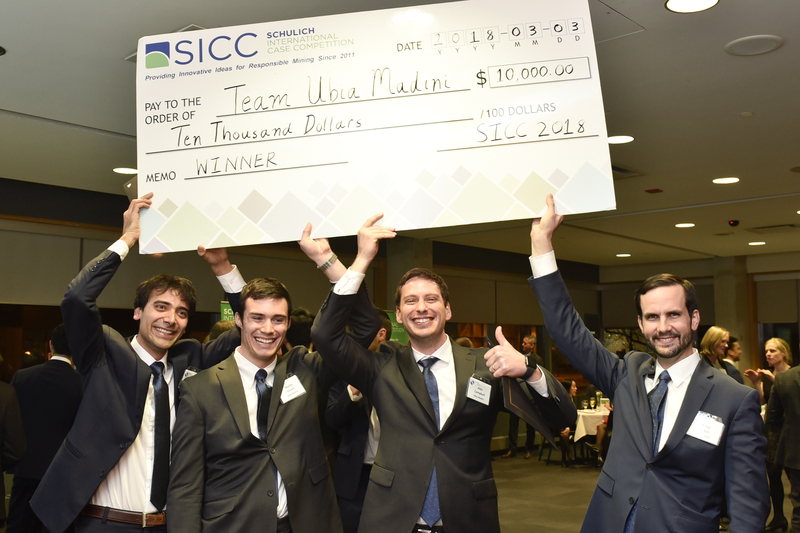 The team of Phillip Ruban, Alex Campbell, Emilio Castillo and Marko Visnjic beat out six other teams from around the world to win the Schulich International Case Competition on March 3 at York University in Toronto. The top prize was 10,000 Canadian dollars, or about $7,800. Before investing in mining project in a politically unstable jurisdiction where the equitable distribution of wealth is in question, how should a mining company identify and then incorporate this challenge into their decision-making process? After the decision to invest has been made, how should mining companies ensure that the wealth they create is transparent to all stakeholders and equitably distributed? Identify one publicly listed mining company that operates in a politically unstable country and has been successful in addressing the equitable distribution of wealth. Illustrate how they have turned this challenge into an opportunity for all stakeholders to share in the wealth that was created. Mines was the only U.S. university with a team in the finals – the other six hailed from Australia, the Middle East and Canada. In the preliminary qualification round, all registered teams were provided with an essay question, with the top seven invited to present their ideas March 3 to a panel of senior mining industry experts. The Mines team was made up a mix of graduate students studying mining engineering and mineral and energy economics. The competition was largely MBA students. Mines faculty who supported the team included Graham Davis, professor of economics and business; Sebnem Duzgun, Fred Banfield Distinguished Endowed Chair and professor of mining engineering; Rod Eggert, professor and Viola Vestal Coulter Foundation Chair in Mineral Economics; Stephen Enders, professor and head of the Geology and Geological Engineering Department; John Grubb, adjunct professor of mining engineering; and Jessica Smith, co-director of the Humanitarian Engineering Program and associate professor of engineering, design and society.